Today's show is also sponsored by Pitney Bowes. Pitney Bowes is the industry leader in mailing and shipping solutions. No matter what you send, or how often, Pitney Bowes has the solution that precisely fits your needs. Pitney Bowes is offering Investing in Real Estate listeners a free trial! Visit pb.com/investing to learn more. The Federal Reserve just announced three hikes in interest rates this year. This changes the game for many retail banking products, including mortgages. Higher rates will make purchasing homes harder and more expensive for homebuyers. On this episode, Natali and I are discussing the implications of interest rate hikes in 2018. We'll talk about how increased rates will affect purchases, and what this means for investors. Don't miss episode 280 of Investing in Real Estate! The American public had been warned that interest rates would rise in 2018. What we didn't know is that the increase would be so drastic, and so frequent. So what does this mean? If you're planning on borrowing money, you can count on paying much more for it. When it comes to the retail housing market, this is bad news for many. Higher rates will prevent homebuyers from making purchases. If you were planning to purchase your real estate investments with a conventional mortgage, this newly increased interest rate could be an issue. Your ROI will immediately decrease if you’re paying more for a mortgage. That’s why cash is king; if you’re paying with cash, you’ll be unaffected by interest rates. Smart investors know that now is the time to use your cash reserves! As Robert Kiyosaki says, "when the going gets tough, the tough go shopping." And because fewer Americans will be shopping for primary residences, this could potentially be a great time to be a real estate investor. If people are not owning their homes, they will need a place to rent. 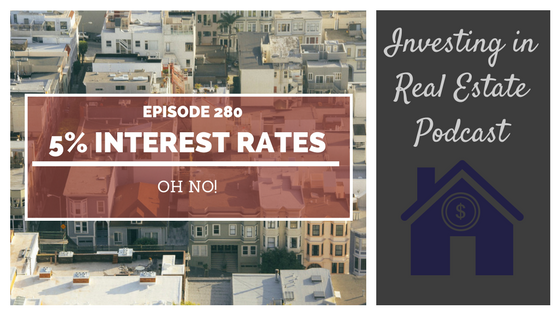 On today's show, we'll discuss more about rising interest rates. We'll talk about housing prices, and the best way to store your savings. We'll talk about changes to HELOCs, and much more. Please join us for episode 280 of Investing in Real Estate! What do rising interest rates mean for renters in A class properties? What happens to the price of goods when interest rates are raised? How can you shop for the best savings account?